One of the core delights of Magic: The Gathering is how it plays with its own rules. While there are big, complicated rules that underwrite every moment of Magic, one of the biggest draws to the game (for me, anyway) is how specific cards use that complicated rule set to do strange, unexpected things. Winning the game by amassing treasure or going on a quest to find too many leviathans are some of the pleasures that I have had the luck of enjoying. The brilliance here is not the joke (although this hyped-up octopus is very cool), but instead it is the way that the card recognizes that Magic is a social phenomenon. I’ve played hundreds of matches crammed into small rooms with other people, and this card recognizes that cultural reality and turns it into a mechanic. Unstable is a “silver border” set, meaning that it cannot be played in traditional competitive Magic (which are “black border”). 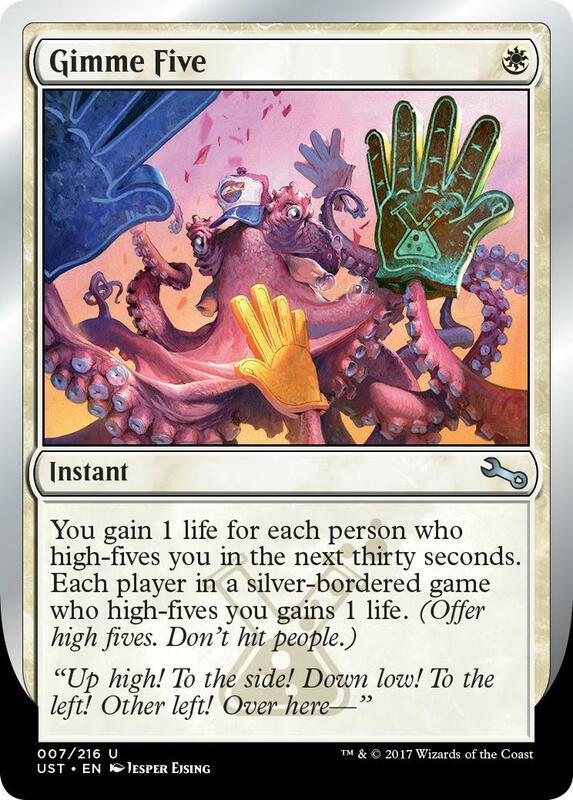 The beauty of this, though, is that an Un- set can have cards that allow you to high five. They can break out of the very specific bounds that competitive Magic sets for itself and explore further into the world of social interactions, group joy, and weird things that the competitive framework of the game must necessarily leave out. Unstable will be available for your funtime experiences starting December 8th, 2017.